PYEONGCHANG, South Korea -- In an extraordinary moment that could hardly be fathomed one month ago, North and South Korea entered the Pyeongchang Olympic Stadium together on Friday, marking the official start of the 2018 Winter Games. South Korean President Moon Jae-in declared the Pyeongchang Winter Olympics officially open during a ceremony that featured the rival Koreas joining hands and marching together in the small ski resort town in eastern South Korea. Pence: "Aggressive" new N. Korea sanctions coming "soon"
Vice President Mike Pence is leading the U.S. delegation to the games, and he and his wife Karen attended the opening ceremony in an audience box with South Korean President Moon Jae-in. Japanese Prime Minister Shinzo Abe was sat in the same row. North Korean governement figure head Kim Yong Nam and the Kim Jong Un's sister Kim Yo Jong were also in the box, seated a row behind the Pences. A spokesperson for Pence told CBS News there was "no interaction" between the vice president and the North Koreans. CBS News White House reporter Jackie Alemany says Pence stood one time during the opening ceremony, as Team USA marched in to stadium to the tune of "Gangnam Style." During the 2000s, North and South Koreas'' athletes marched together at the opening and closing ceremonies of several international sporting events, including the 2000 Sydney Olympics. The last time before Friday was at the Asian Winter Games in China in 2007. The two countries have also formed a joint women's hockey team, which consists of 23 South Koreans and 12 North Koreans. North Korea has sent hundreds of people to Pyeongchang, including officials, athletes, artists, journalists and a 230-member cheering group. 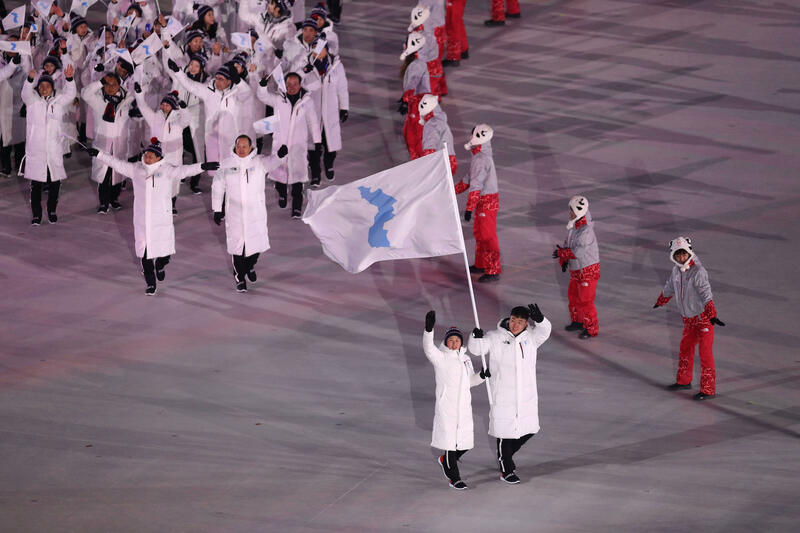 The North and South Korean athletes marched together behind a blue-and-white "unification" flag for the first time in more than a decade. It was an emotionally charged moment. The two Koreas, which remain technically at war, have cycled through countless periods of chill and thaw since their division 70 years ago. North Korea boycotted the 1988 Summer Olympics in Seoul and blew up a South Korean commercial airliner the year before. The past year has been particularly acrimonious as the North has accelerated its nuclear weapons development and test launches of missiles that are now believed to be able to reach most or all of the United States, South Korea's most important ally. The delegation's most substantive event may come outside of the Olympic ambit on Saturday. Along with the rest of the North's senior delegation, Kim Yo Jong was to have lunch with Moon at the presidential Blue House. The meeting could turn out to be just a lunch, a photo op or a nicety. But it is so unprecedented, and its announcement on Thursday was so sudden, that rumors are already swirling it could open the door to much more - perhaps even an offer for Moon to travel to Pyongyang, the North's capital. Considering the depth and complexity of the problems that keep the Koreas apart, it's highly unlikely a luncheon would lead to an immediate breakthrough on something like the North's nuclear weapons development.